Demons, curses, and standard-issue bad luck invariably plague those foolish enough to fish a Ouija board out of a stranger’s trash bin or unfortunate enough to find a doll in a sealed cupboard at their newly-purchased home. These haunted objects are usually donated by their panicked owners with the assurance that whatever Evil Lurks Within will be conveyed to the owner of the “museum.” I’m sure there must be loads of paperwork to transfer title to demonic entities. The “museum” often takes the show on the road, ensuring the safety of viewers by taking every precaution such as dowsing furniture in holy water or locking haunted dolls in glass cases. Objects are scanned, x-rayed, and exposed to recording devices, “Spirit boxes,” and video surveillance. Haunted museum staff have dozens of curatorial duties rarely found in standard institutional collections. Due to my past lives as an antique dealer and attic-ferret, I really could not let this October go by without jumping on the haunted-by-the-spirit-of-a-murderous-moving-clown-doll bandwagon. Book the U-Haunt truck!—we’ll be loading up some possessed possessions,* and spend October looking at Objects of the Damned: haunted, cursed, or hoodooed furniture, clothing, tools, and more. If an empty rocking-chair is seen to sway back and forth when apparently unoccupied, it is supposed that the chair is held by the spirit of some deceased member of the family, who has come back to choose the next to go, and call that person quickly. Michigan. And as a vector for ghosts. Never leave a rocking chair rocking without anybody sitting in it—it will be sure to be occupied by an unwanted ghost. I’ve suggested before, without any scientific evidence whatsoever, that the motion of the rocking chair somehow “records” a ghostly image in the chair. And just as ghosts seem to get attached to a house, they can be drawn to a beloved object, like their old chair. An interesting ghost story is told that a widow at Findlay, O., is visited every evening by her deceased husband, who still clings to the old rocking chair, even though his bones lie in the cemetery. The chair begins to rock every evening, and the widow is sure her husband’s spirit occupies it. When I was a child, 20 years ago, I lived in an old house near Contee Station, on the Baltimore and Ohio railroad. Our home had an old-fashioned wide porch completely encircling it. From my window I could see a chair that always sat upon it. Often on still nights this chair would commence to rock violently when no one was in it, when the other chairs on the porch were still, and when the leaves on the trees were not even turning, so windless was the air. This happened often in my own recollection, and the chair was always thought to be “haunted” by myself and the others of our family. The chair had been the property of an aunt, who sat in it hours at a time knitting. After she had died it had descended to my mother. “Three years ago an old farmer died five miles from here. He left seven grown children, two sons, and five daughters, all unmarried, and living at home. There is a rule in the family, and it has been so ever since the old gentleman died, that once a week each child shall spend a half hour in the old man’s big rocking chair, and think of him, commune with him, pray for him, ask his advice as to the farm management. They believe that he wants it to be thoroughly understood that he is still the master of that big farm. I guess he is, too, for the children are running the place on the co-operative plan, and they are getting along all right, apparently. NOTE. Real names of persons who figure in these stories are in The Call’s possession. The Story of the Haunted Rocking Chair. About 10 years ago when I was quite a little girl my father rented an old fashioned house situated on Hempstead harbor, Long Island. It was a beautiful old place, with large grounds and commanded a magnificent view of the sound. The ground floor of the house consisted of a front parlor, a library, a dining room, a kitchen and a small room which opened off the library, and at one time was apparently used as a sitting room by a former occupant of the house. The house was partially furnished when we moved in, and some of the furniture we decided to use. In the little room off the library there was an old fashioned rocking chair with a cane back and upholstered seat. Father fitted up the little room as a smoking room, or “den,” as he called it, but it was so pleasant and sunny that I spent a considerable part of my time there reading and sewing. The little rocking chair I considered my especial property, and at my request father let it remain in the room for my use. One rainy evening several months after our arrival mother and I were in the house alone. Mother was suffering from a sick headache, my sister Mabel was away on a visit and father was detained in the city on business. That evening I was in mother’s room reading for her, for, as I have said, it was my usual custom to spend my evening in the little sitting room off the library. Mother’s room was directly over this and any sounds that would come from it we could have heard very plainly. The servants were also out for the evening, as it was their night off, and we were in the house quite alone. While in the midst of a story, which I was reading aloud to mother, I was suddenly surprised to hear the sound of someone singing in low contralto voice. The sounds appeared to come from the little smoking room below. Mother heard them, too, and asked me what it was. I thought it very strange, but I did not think that it was anything supernatural. In fact such a thought never entered my head. Still the singing went on, now high, now low, as the voice of the singer rose and fell. Mother asked me if it could not be some one outside the house, but I said no, that undoubtedly the sound came from our smoking room below. I finally concluded to go down and see if I could who the singer was. I went down stairs and paused for a moment before the door of the little room, which was closed, although I had no recollection of closing it before I came upstairs. The song now came very plainly through the closed door. The air was that of an old lullaby and with it I heard the sound of an old rocking chair backward and forward, just as if someone was singing a child to sleep. I opened the door noiselessly and paused on the threshold of the room. The sound of the singing and rocking continued. Never will I forget the strange feeling that came over me when I entered the room. I seemed to know that there was another presence in the room besides myself, a presence that I could not see. I switched on the electric light and the sound ceased. There was no one in the room and it was just as I left it. I stayed there for a few moments and then went out again, as if nothing unusual had occurred. I went into the library and watched the room through the open door. And then a strange thing happened. The rocking chair began to move slowly backward and forward. It rocked and rocked. Then very slowly and almost indistinctly at first came the song of the invisible singer. I waited to hear and see no more, but fled upstairs to mother. I told her that one of the girls was back and was singing in the library, for I did not want to frighten her. She was too sick to be much surprised and accepted my explanation without a word. For some time we heard the song of the ghostly singer, but finally it stopped and father came in soon afterward. I told him what had occurred, and the next day we moved out. We learned afterward that the house was supposed to be haunted. The story was that a young married couple had lived there a good many years ago and that the smoking room had been a favorite place of the young wife. Her baby had been taken sick a few months after it had been born and had died shortly afterward. The young wife had been stricken with grief and had also died a short time after the death of her baby. 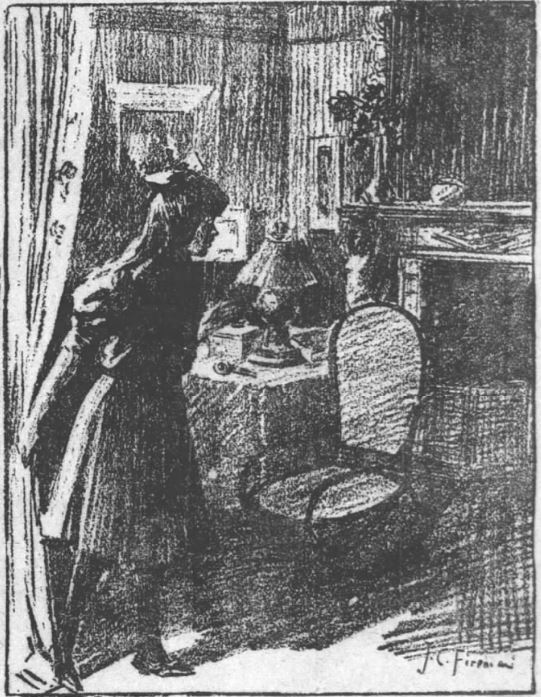 It was said that on the anniversary of her death the song that she used to sing to her baby would be heard coming: from the little room, accompanied with the sound of a rocking chair moving backward and forward. Other occupants of the house had had the same experience as mine. I’ve had a couple of interesting experiences with rocking chairs while I was writing the Haunted Ohio series. I stayed at an inn in the town of Zoar, Ohio. The room was charming, with its exposed brick and beam construction and a cheerful embroidered patchwork quilt on the high spool bed. All quite charming, except for the dark curved wood rocking chair with a cranky elderly lady ghost in a white cap sitting in it. I resented sharing a room when I had paid for single occupancy. In another case, I was called to an expensive house in a modern subdivision where an antique rocking chair sat in an otherwise empty room, as if in quarantine. The owners had bought it to rock their baby to sleep, but the haunting started as soon as the chair was brought into the house, plus the baby howled and fussed whenever rocked in the chair. I saw a squarish, older woman sitting in the seat. She was surrounded by a black cloud and I had a vision of her pinching the baby to make it cry. She hated children and she just wanted everyone to go away. Naturally I suggested that the owners get rid of the chair; they balked at the idea of a spirit dictating their actions, but they had thought of chopping it up and burning it–something that made my antique dealer’s soul cringe. And that was where I left it–with a malevolent ghost sitting in a rocking chair locked away in a remote room. Other accounts of haunted rocking chairs? If you just loop some heavy-duty black thread around a chair leg without tying it, you can discreetly pull it free when anyone tries to inspect too closely. chriswoodyard8 AT gmail.com. One man found dead in it. One man’s head cut, body bruised, arm fractured by it. One man pitched on his face out of it. One man’s glasses broken and finger mashed by it. One woman thrown out of it. One baby found under it. One dog knocked senseless by it. One man’s collar bone broken by it. One man pushed down stairs by it. Joe Nickell, Mysterious Realms, 24, Liberty Hall, Frankfort, Kentucky. Alan Brown, Ghost Hunters of the South, 73, Stranahan House, Fort Lauderdale. Harvey Kurtzman (script), Jack Davis (art), “Hoohah!” Mad #1 (Oct.-Nov. 1952). Excerpt. The superstition I always followed (and can’t remember why – it’s been that long) was that when you got out of a rocking chair, you made sure to stop its rocking. An omen of death, I guess. Kind of the opposite of the usual stories. How could I have missed this perpetual rocking machine of a chair from Undine at Strange Company?